There isn’t a single metric where I met expectations or even close to it. In fact, there isn’t a single metric in that I can point to while saying, “Yeah, there was some progress there” and feel good about things, even if I did come up a bit short on my targets. Nope, this past month was woeful with respect to trackable metrics. Oh, and I have a full-time job too. But let’s not sugarcoat it or make excuses, the point of these KPIs and measuring them is that I committed to achieving these results. There was no, “If I get around to it” escape clause – I said I was going to do these things and I’m missing the mark, so that’s on me. The lesson here is, own your failures… And April was an abject failure. I’ll break stuff down and then in the conclusion, I’ll talk about what’s coming! There’s no delicate way of saying this, traffic didn’t grow, it actually dropped in a month-to-month measurement by about 16%. I’m still ahead of February, but I’ve given up most of the gains from March, so that’s annoying. The one silver lining was another 20% jump in month-on-month organic traffic growth. That’s really the traffic source I’m keen to grow, so seeing an overall traffic fall for the month, but getting organic traffic growing 20% is a nice result, I’m happy with that. The two big losers for driving traffic were my Facebook Group and Udemy- I had Buffer setup to auto publish blog posts every day to the FB Group and I let the backlog lapse so it stopped publishing, and I missed two weeks in April of sending out blog links to my Udemy students which hurt the numbers. Those drops are 100% on me not following through, so this poor result is my doing. If there’s an area of real concern for me within Casual Marketer, it’s the fact that I’m not doing enough to grow my email list. This has been an ongoing problem that I’ve failed to address. Basically, I’m staving off atrophy by adding enough new list members to keep the number stable, but I’m not adding enough new people to my list to get the growth I want to have. That’s not good enough – if your list isn’t growing, it’s shrinking. I need to work on fixing this rot in the next few weeks. This is a pretty stable source of income, but April was down on March which was a bit disappointing. The start of April was really strong and it looked like it was going to be a great month, but then something happened in the third week and the rest of the month was really slow. Udemy is hard to gauge when it’s on autopilot like it is for me. I’m not really creating new courses, so my financial situation is largely in their hands. When they sneeze, I catch a cold, which would not be ideal if this was a significant revenue source for me, but as it’s really not, I’m content with it. That said, my plan over the next month or two is to create a new Udemy course and release it just to see what happens – it’s going to be something of an experiment. 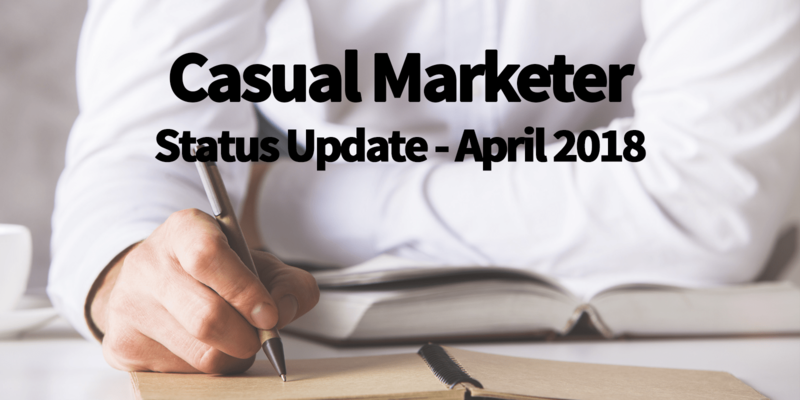 Casual Marketer is building out a nice, slow stream of ongoing affiliate revenue, so that’s a positive and that continued in April. There really wasn’t anything new in this area to report either positively or negatively. I’d like this revenue stream to increase more to meet my targets, but with everything else going on and not making good enough progress, I’m going to park this to the side and focus on some of the other KPIs for the rest of the quarter. Again, without mixing words, this past month was a write-off from a results perspective. I seriously can’t even put my finger on one thing in Casual Marketer that improved in April that I can take credit for. That’s a poor result. In fact, I would go so far as to say it was my single poorest performance personally in any of the online businesses that I’ve ever owned. Now, having put that out there, it’s time to move onwards and upwards. I had a few good ideas for some new information products that I’m going to start working on in the near future. I’m also still working towards closing out existing projects before I take on anything new – this is a big one for me, focus on the balls that I’m already juggling. But the upside to the ideas is that my juices are flowing again. What needs to happen from here is that I go into “production mode” and start turning the ideas into something tangible. That’s the work ahead of me for May and the rest of the year.